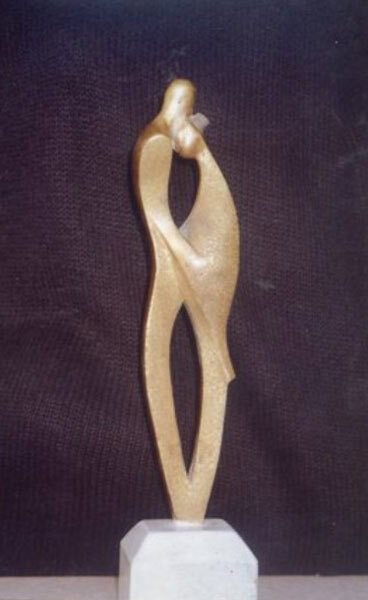 The love of the arts has been passed to us by genes, since both of my brothers and my son are also sculpturists. 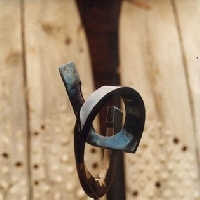 Since my childhood I had a great passion to paint and to sculpture. 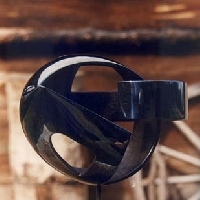 From 1980 to 1983 I studied in the Glass Department of Decorative Arts Faculty of the Fine Arts Institute of St. Petersburg (Russia) After Mukhin. 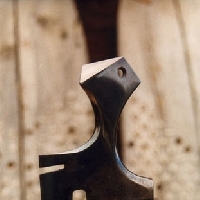 Later I worked in the Sculpture Department of the Yerevan Fine Arts Fund, where I have both worked and studied under the leadership of famous sculpturists. After getting enough experience I continued my education in the Decorative Applied Arts Department of Yerevan Naghash Hovnatan University. Through the years I was assured that I have found the occupation, which is my calling and my passion. I love the stone, and I try to give my feelings and thoughts to the stone and to express them through it. 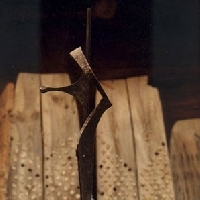 My works are very different: monuments, sculptures, statues and particularly cross-stones. I am the author of a number of monuments and cross-stones, which are located both in the various cities and villages of Armenia and abroad. I made the first cross-stone in 1987(the 1st of about 350 new cross-stones (2-3,5 meters of height). 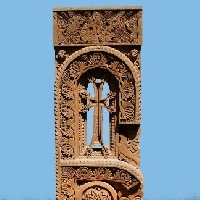 The art of cross-stones is unique to Armenian people and it has a history of many centuries. 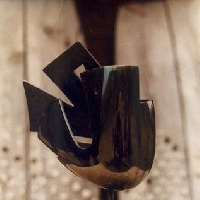 Through this unique art the Armenian people express its identity and communicate with the other peoples of the world. 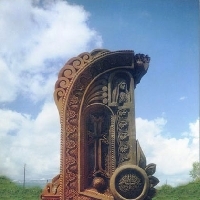 On 2005 His Holiness Garegin II Supreme Patriarch and Catholicos of All Armenians ordered 37 cross-stones on the occasion of the 1600 anniversary of Armenian Alphabet, 36 of which are imaging of 36 letters of Armenian Alphabet and the Mother Cross-stone, which includes the all 36 letters on itself. 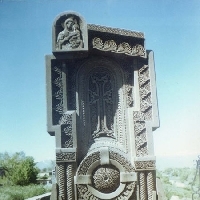 These beautiful and unique cross-stones are located in the backyard of St. Mesrop Mashtots Church in Oshakan village. St. Mesrop Mashtots is the creator of the Armenian Alphabet (406 A. C.). 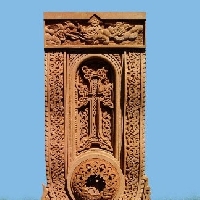 The mentioned cross-stones are amazing innovations in the history of the Cross-stone art of Armenia. On 1988, when a horrible earthquake happened in Armenia, which stole more then 25,000 lives, many countries helped us. I had an idea to donate cross-stones to these countries as the expression of our gratitude. 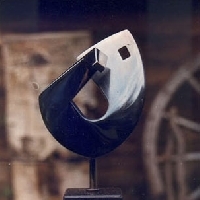 On 19 August of 1993 a contest and symposium of sculpture was held in Belgrade. 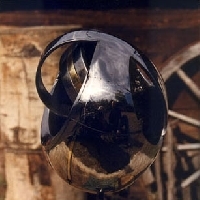 Many sculpturists including myself from 15 various countries took part in it. My cross-stone, made from marble, took the 1st place. It was a miracle and new breathe for Europe overflowed with abstract. It helped Europeans to recognize the identity of the Armenian nation, which is although a small nation, but it has great spiritual values and cultural inheritance. The Armenian type of cross and the Armenian writings are prevailing in my cross-stones. Our language and faith kept us during the centuries. At present I own an art studio, where also my son and my brothers continue to develop and spread the art of our grandfathers all over the world. I want to express my deepest gratitude to the great Armenian architects and masters of Cross-stone art Vetsik of Kecharis Monastery (13th c.), Momik of Noravank Monastery (13-14th cc. ), Yeritasard of Makaravank Monastery (13th c.), Poghos of Deghdzout Monastery (13th c.), Grigor of Goshavank Monastery (10th c.), etc. 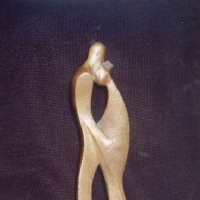 1993 January 22 Golden Medal from The Union of Culture and Education of Serbia. For the donation of cross-stone to Yugoslavian aviators, who died accidentally flying to Armenia to help Armenian people on 1988 horrible earthquake. When I look on the stone, I want to scare it. If you stop in front of something and you are afraid of, you can create nothing. There is a spirit in the stone, which is awakening in you during the sculpturing. The stone itself dictates its task. It is coming from the ancient times that when you take away the useless parts of the stone, the rest part is only yours. The cross-stone is a national symbol for us. 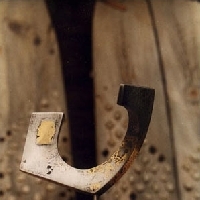 Our grandfathers were used to put a cross-stone, when they establish a new town or a village, build a new church or a new bridge, or when they marry their children. 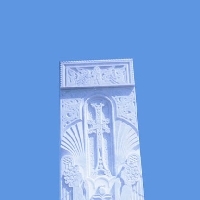 The cross is common for all Christians, but the cross-stone is uniquely Armenian. It is well known that during the history of Armenian people the cross-stone became the most way of worship of the Son of God Jesus Christ. Thus the faithful Armenian master could not stay indifferent to this art. He expressed his deep faith and love of the Son of God from the bottom of his heart through his fingers on the stone by vitalizing it and making it to speak. And the stones of Armenia became amazing and beautiful crosses, which are coming from the centuries and are as stronger as older. I continue the work of my grandfathers by giving a new life and breathe to the Armenian stone. Toof. and creating the. Cross. as a symbol of unbreakable faith both for all Armenians and for all Christian world.